A Perfect Billing Solution for your business. Billing software designed to meet billing of purchase and sales of goods which is very convenient and reliable, it produce invoice sales as well as purchase. In every sales or purchase of goods it tracks the payment logs of customer, so it easy to track pending balance. It also saves time while adding products, instead of adding product one by one , you can have provision for upload bulk products through excel. Discount provision available for order management. Different report are available to track every order and purchase, also tracks all GST data. 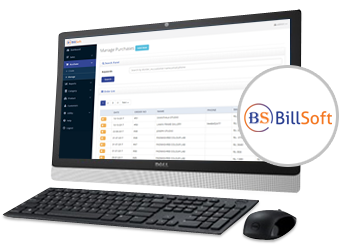 Smooth billing software for order and purchase with invoices. Reverse and forward billing system combined, you can whichever you want. Option for discount entry in sales bill. Payment log of each billing which applies for sales as well as purchase. Manage multiple sales billing at a same time. Which covers all sales value along with GST and filtering option according to date. Which covers all purchase value with GST and filtering option according to date. Gives the Detailed Profit and loss reports with date filtering option. It keeps tracks of payment pending of a customer with order id with advanced filtering option. It keeps tracks records of payment pending to a supplier with advanced filtering option. Purchase management allows creating and managing the purchases like GST and other Billing information. Product management enables to manage the products like Searching with the advanced filter options, view the list of products and delete the products, it makes product management efficient and effective. Purchase register report which is used for CA or Accountants which contains purchase related data with total value and GST separated values where they can upload for their tally software. Sale register report which is used for CA or Accountants which contains sales related data with total value and GST separated values where they can upload for their tally software.